Michael Anthony Easler played 14 major-league seasons between 1973 and 1987. A left-handed hitter and right-handed thrower, Easler was nicknamed “The Hit Man” and “Line Drive” for his prowess at the plate. He was also sometimes referred to as Easy in reference to his last name, his graceful hitting stroke, and his quiet demeanor.1 The Hit Man was the most commonly used nickname for Easler and the one that he himself embraced during his career. The 6-foot-1 Easler played outfield and first base, and, during his tenure in the American League, often was a designated hitter. Easler played for six teams: the Houston Astros (1973-1975), California Angels (1976), Pittsburgh Pirates (1977-1983), Boston Red Sox (1984-1985), New York Yankees (1986, 1987), and Philadelphia Phillies (1987). He was a .293 career hitter who hit over .300 four times. While a member of the Pirates, he was selected to the National League All-Star Team in 1981 and was a part-time player on the Pirates’ World Series championship team of 1979. In 2004 Easler was inducted into the Cleveland Sports Hall of Fame. A 2014 Cleveland.com online poll ranked him the best baseball player to ever come out of Northeast Ohio.2 After leaving the majors as a player, Easler played professional baseball in Japan, then started a successful career as a coach, particularly as a hitting instructor. Easler’s decade-long minor-league odyssey began in Covington (Virginia) in the Appalachian League, the home of the Astros’ rookie-league affiliate. In many respects, Easler’s first year of professional baseball set the tone for his minor-league career. He excelled at the plate, leading the team in batting average at .319 while struggling in the field. Easler proceeded swiftly through the Astros’ minor-league system, posting excellent power numbers and batting averages year after year while struggling defensively in the outfield. As the early 1970s turned into the mid-1970s, Easler proved to be stuck in Triple-A baseball, putting up excellent batting numbers year after year but receiving nothing more than September call-ups from the Astros. Easler got his first shot at the major leagues in 1973 after splitting the season between the Astros’ Double-A affiliate in Columbus (Georgia) and Triple-A Denver, posting a .297 batting average with 13 home runs and 58 RBIs in 96 games. He made his major-league debut for the Astros on September 5, 1973, against the Cincinnati Reds at the Astrodome. Pinch-hitting for catcher Skip Jutze in the ninth inning of a 9-3 Astros defeat, Easler grounded out to first in his only plate appearance. Easler went 0-for-7 in six games for the Astros during September 1973. Easler returned to the Denver Bears in 1974 and he hit .283 with a team-leading 19 home runs with 63 RBIs. He got his second September call-up that season. Again, he struggled against major-league pitching. Easler went 1-for-15 with six strikeouts, serving exclusively as a pinch-hitter. He returned to the Denver Bears in 1974 and hit .283 with a team-leading 19 home runs and 63 RBIs. One of his late-season home runs for the Bears was struck at Lawrence Stadium in Wichita, Kansas. The ball traveled well over 400 feet, then bounced across McLean Boulevard before rolling into the Arkansas River. Following a strong spring training in 1975, Easler was placed on the Astros’ Opening day Roster, but the player later known as the “Hit Man” struggled for the third time at the big-league level, going 0-for-5 in five April pinch-hitting appearances. Houston sent Easler back to Triple-A, now in Des Moines, Iowa, to regain confidence, which proved successful. “I was trying to pull everything for a long time after I came down from Houston,” Easler said. “(Iowa manager Joe Sparks) pointed out that I was looping my swing upward. He got me swinging level and hitting straight away…”7 His confidence regained, Easler had another outstanding season in Triple A in 1975, hitting .313 with 15 home runs and 69 RBIs. On June 25, 1975, Easler was traded for the first time, sent to the St. Louis Cardinals for a player to be named later who turned out to be Mike Barlow, a right-handed pitcher. Easler spent the remainder of 1975 and the 1976 minor-league season with the Cardinals’ American Association affiliate in Tulsa. “The Hit Man” continued to dominate Triple-A pitching in 1976, batting a league-leading .352 with 26 home runs and 77 RBIs. He finished second to Denver’s Roger Freed in the race for American Association MVP. Despite his success at the highest level of the minors, Easler did not get a shot at the big leagues with the Cardinals in either 1975 or 1976. The Cardinals’ strong outfield regulars, Lou Brock, Bake McBride, and Reggie Smith, and backups Willie Crawford, Jerry Mumphrey, and Mike Anderson, kept Easler off the 25-man roster. On September 3, 1976, the Cardinals traded Easler to the California Angels for minor-league third baseman Ronnie Farkas. The Angels added Easler to their September roster. He was primarily a designated hitter and pinch-hitter. Easler got his most extensive major-league experience to that point, hitting .241 with 4 RBIs in 54 at-bats for the Angels. On April 4, 1977, two days before Opening Day, the Angels traded Easler to the Pittsburgh Pirates for minor-league pitcher Randy Sealy. The Pirates designated Easler for assignment to Columbus of the International League, where he spent virtually all of the 1977 and 1978 seasons. Again, Easler excelled against Triple-A pitching, batting over .300 both years and hitting 18 home runs each season. Again, talent in his parent club’s starting outfield, this time Al Oliver, Bill Robinson, Dave Parker, and Omar Moreno, kept him out of the majors. In a September 1977 call-up, Easler went 8-for-18. In 1978 he made no appearances for the Pirates. After the 1978 season, the Red Sox purchased Easler’s contract, only to trade him back to Pittsburgh for minor leaguers George Hill, Martin Rivas, and cash during the next year’s spring training. For the first time in 1979, Easler spent an entire season in the major leagues. 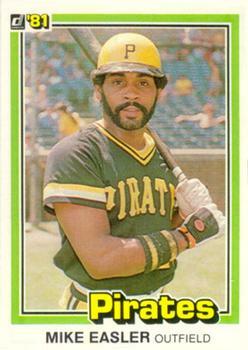 Serving almost exclusively as a pinch-hitter, he had 62 plate appearances for the world champion Pirates. Easler had only three starts. In 54 at-bats, he batted .278 with a strong on-base percentage of .371, 2 home runs, and 11 RBIs. One of his home runs was a 13th-inning, game-winning shot off Skip Lockwood of the New York Mets on May 16 at Three Rivers Stadium. Easler made his only career playoff appearances for the 1979 Pirates, going 0-for-2 in three plate appearances during the NLCS and World Series. In 1980 Easler became a regular in the Pirates’ outfield. The left-handed-hitting Easler and right-hander Lee Lacy platooned in left field as a replacement for the aging Bill Robinson. Easler and Lacy excelled as a platoon during the 1980 season, proving to be one of the few bright spots on the disappointing Pirates club of that season, which finished third in the NL East. Easler hit .338 with 21 home runs and 74 RBIs in 393 at-bats. He hit for the cycle against Cincinnati on June 12 and was named National League Player of the Week for the week of June 15. On the other side of the platoon, Lacy hit .335 with 7 home runs and 33 RBIs in 278 at-bats. Both Easler and Lacy batted for significantly higher averages than 1980 NL batting champion Bill Buckner (.324), but neither managed the required number of plate appearances to qualify for the award. The 1981 All-Star Game was Easler’s only All-Star appearance or selection to the team. He entered the game in the top of the sixth inning, replacing his Pirates teammate Dave Parker in right field. In the top of the eighth inning, he was walked by Milwaukee’s Rollie Fingers and later scored on Mike Schmidt’s home run. Easler grounded into a force out to end the top of the ninth against Toronto’s Dave Stieb. The National League won its 10th straight All-Star Game, 5-4. Easler continued to post strong offensive numbers in 1982 and 1983 for back-to-back 84-win Pirates teams. In 1982 he hit .276 with 15 home runs and 58 RBIs. In 1983 he hit .307 with 10 home runs and 54 RBIs. Easler remained a defensive liability, often facing late-game defensive replacements by manager Tanner. To open the 1983 season, Tanner benched Easler in favor of the speedier and more defensively proficient Lacy. Easler described the benching as the “low point of my baseball career.”11 His hitting soon won him a place back in the lineup. Like the rest of the Red Sox, Easler’s power numbers dipped considerably in 1985. He hit .262 with 16 home runs and 74 RBIs in 155 games, primarily at designated hitter. After the season, the Red Sox and Yankees swapped designated hitters. Easler headed for the Bronx while Don Baylor was Fenway-bound. Easler had an excellent season for the 1986 Yankees, batting .302 with 14 home runs and 78 RBIs. After the season, the Yankees traded Easler and middle infielder Tom Barrett (brother of the Red Sox’ Marty Barrett) to the Philadelphia Phillies for pitchers Jeff Knox and Charles Hudson. The Phillies used Easler part-time in left field, where he hit .282 in 33 games. The Yankees reacquired him in June for outfielder Keith Hughes and third baseman Shane Turner. Easler hit .281 for the Yankees in 65 games that season, splitting his time between the outfield and designated hitting. The Yankees released Easler after the 1987 season, which proved to be his last in the major leagues. Easler was a .293 career hitter with 118 home runs and 522 RBIs in 4,061 plate appearances. Easler played parts of two seasons (1988-1989) for the Nippon Ham Fighters in the Pacific League of the Nippon Professional Baseball League. Working primarily as a DH, Easler hit .302 in two seasons with the Fighters. Easler played his final season of professional baseball in the fall of 1989 with the West Palm Beach Tropics of the Senior Professional Baseball Association. The “Hit Man” went out in style, batting .323 in 35 games for the Tropics. Easler became a highly in-demand hitting instructor, on both the major- and minor-league levels. He was the hitting coach for the Milwaukee Brewers (1992), Boston Red Sox (1993), St. Louis Cardinals (1999-2001), and Los Angeles Dodgers (2008). Easler’s most famous prodigy as a hitting instructor was Boston’s Mo Vaughn. After struggling in his rookie year for the Red Sox, Vaughn, under Easler’s tutelage, became one of the American League’s most feared hitters and, in 1995, won the Most Valuable Player Award. After Easler left the Red Sox organization, Vaughn hired him to work as his private hitting instructor for the remainder of his career.13 Also was the hitting coach for the Double-A Jacksonville Suns (2006) and the Triple-A Las Vegas 51s (2007), both part of the Dodgers organization, as well as the Triple-A Buffalo Bisons, the New York Mets’ International League affiliate (2011). Additionally, he has served as a roving, minor-league hitting instructor in the Dodgers and Mets organizations. Between his stints as a hitting coach, Easler was a manager four times. In 1990 he managed the Miami Miracle of the Class A Florida State League to a 44-93 record. In 1994, he managed the Caguas Criollos of the Puerto Rican Professional Baseball League for four games. A dispute over how to use the team’s pitching staff with Red Sox pitching coach Al Nipper, who oversaw the Red Sox affiliated-team on behalf of the major-league organization, led to Easler’s abrupt dismissal. During spring training in 1995, Easler was let go by the Red Sox for refusing to work with replacement personnel during the lengthy players’ strike which had started on August 11, 1994. He returned to managing in 1998, leading the Nashua Pride of the independent Atlantic League to a impressive 59-41 record and a third-place finish. In 1999 Nashua fell to fourth place with a 52-67 record. Easler became the St. Louis Cardinals’ hitting coach and served for three years (1999-2001). In 2004 he coached the Florence (Kentucky) Freedom of the independent Frontier League In 2004 Easler was replaced by Eddy Diaz as manager for the Triple-A Yucatan Leones of the Mexican League, and later took the reins for the final 49 games of the Florence (Kentucky) Freedom of the independent Frontier League. 1. Anthony Cotton, “Happy at Going Halfsies,” Sports Illustrated, August 18, 1980. Accessed on November 17, 2014: http://si.com/vault/1980/08/18/824880/happy-at-going-halfsies-hard-hitting-lee-lacy-below-left-and-mike-easler-constitute-a-mutual-admiration-society-which-is-a-good-thing-because-they-often-share-leftfield-for-pittsburgh/. 3. Claire Smith, “Manager’s Dream Is Lost in the Sun,” New York Times, November 9, 1994; “Easler, Cleveland, Ohio: Deaths,” Ancestry.com. Accessed on November 12, 2014. 5. “Mike Easler,” Baseball-Reference.com: BR Bullpen, February 16, 2013. Accessed on November 17, 2014: http://baseball-reference.com/bullpen/Mike_Easler. 6. David Laurila, “Q&A: Mike Easler – The Hit Man Talks Hitters,” fangraphs.com, September 2, 2011. Accessed on November 12, 2014: http://fangraphs.com/blogs/qa-mike-easler-the-hit-man-talks-hitters/. 7. “American Association,” The Sporting News, June 14, 1975: 36. 8. Anthony Cotton, “Happy at Going Halfsies,” Sports Illustrated, August 18, 1980. Accessed on November 17, 2014: http://si.com/vault/1980/08/18/824880/happy-at-going-halfsies-hard-hitting-lee-lacy-below-left-and-mike-easler-constitute-a-mutual-admiration-society-which-is-a-good-thing-because-they-often-share-leftfield-for-pittsburgh/. 10. Charlie Feeney, “Easler’s Star is Sinking Fast,” The Sporting News, July 11, 1981, 39. 11. “Bucs’ Easler Miffed Over Bench Role,” The Sporting News, April 18, 1983, 16. 12. David Laurila, “Q&A: Mike Easler The Hit Man Talks Hitters,” fangraphs.com, September 2, 2011. Accessed on November 12, 2014: http://fangraphs.com/blogs/qa-mike-easler-the-hit-man-talks-hitters/. 13. Tim Kurkjian, “MO TOWN: The Momentum of Mo Vaughn and the Streaking Red Sox has Boston Dreaming Impossible Dreams,” Sports Illustrated, August 2, 1993. Accessed on November 17, 2014: http://si.com/vault/1993/08/02/129043/mo-town-the-momentum-of-mo-vaughn-and-the-streaking-red-sox-has-boston-dreaming-impossible-dreams; David Siroty, The Hit Men and the Kid Who Batted Ninth (Lanham, Maryland: Diamond Communications, 2002), 161-162; David Laurila, “Q&A: Mike Easler The Hit Man Talks Hitters,” fangraphs.com, September 2, 2011. Accessed on November 12, 2014: http://fangraphs.com/blogs/qa-mike-easler-the-hit-man-talks-hitters/. 15. Claire Smith, “Manager’s Dream Is Lost in the Sun,” New York Times, November 9, 1994.